A police force could be the first to introduce cats alongside its dogs after a five-year-old wrote to the Chief Constable suggesting they should team up. Eliza Adamson-Hopper received a reply from Durham Police chief Mike Barton, thanking her for the suggestion and saying he would pass the idea on to an inspector. Mr Barton included a drawing of his cat, Joey, on the back of his hand-written letter. Now Inspector Richie Allen, of the Dog Support Unit, has confirmed the force will consider using cats in an as-yet unspecified role. Eliza, from Burnopfield, has a cat, Mittens, and a dog called Susie, and the pets are friends. She wanted to know why the police do not use cats. 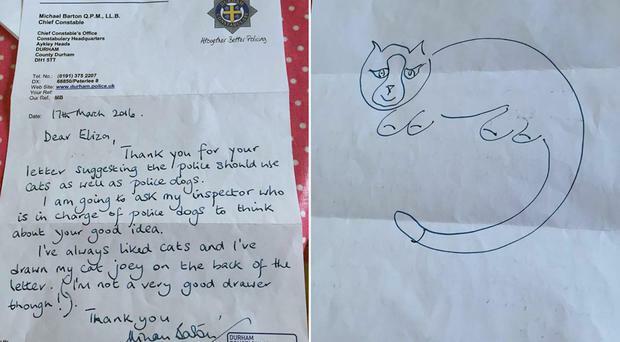 To illustrate the point she sent a drawing of a police officer with a cat and a dog. Her mother, Cheryl Adamson, said: "Eliza has loads of questions for everyone and I don't always know the answers. We said she could write a letter. "We typed out a letter to the Chief Constable, she told us what to write, and we said she might not get a response because he is a busy man. "When we got a reply it was so sweet. "It was not a bog-standard response, it was really personal to her, and we loved the drawing of the cat, it really tickled us." Eliza's letter to Mr Barton pointed out cats' skills which could help policing, such as listening out for danger and finding their way home if they are lost. Ms Adamson, 33, said: "She said they are good at helping people who are stuck up trees. I don't know how often that happens in Durham, but if it does, cats have got it nailed." The proud mother added: "Eliza was delighted with the response, but we thought that would be the end of it. "Then the inspector from the dogs unit sent her a calendar and invited her to an open day." Now Eliza has decided to raise funds for the retired police dogs charity Paws Up. Mr Allen said in a statement that the force was considering recruiting the UK's first police cat. "Their duties and responsibilities have not yet been agreed but if nothing else they will become the force mascot," he said. "Of course if it smells a rat we'll expect it to catch it!"